I’ve included a version of the map as it looks in my mapping book (without the additional river and tree screens added). 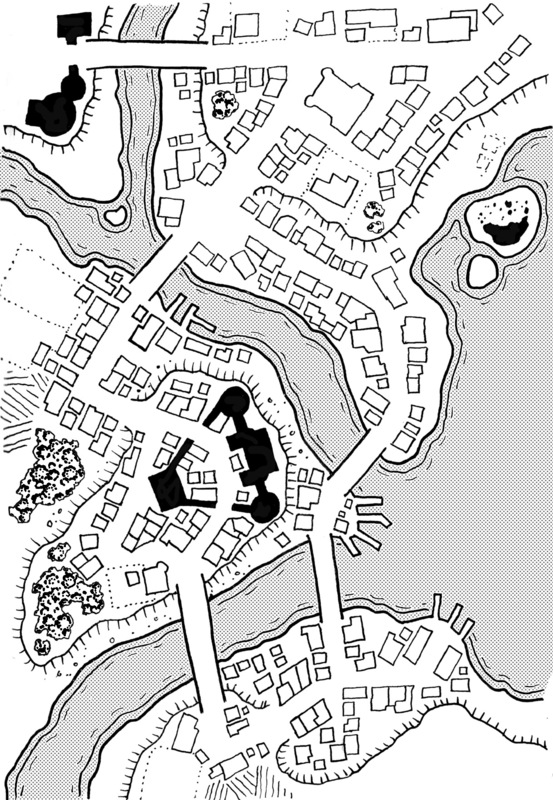 Like the last city map I posted, this map looks significantly larger once scanned than it was in my mapping book. I’ve included a photo of the map as I was in the process of drawing it below. I drew it in my small Dollar Store mapping book using a Sakura Micron 005 pen and a mechanical pencil to lay down the roads before I drew in the buildings (all I had on me at the time). Because the scale of these drawings is so small to begin with, the scanning process often makes me somewhat uncomfortable with the final product as I can inspect it much more closely, showing off how uneven and rough some of the lines are (especially since I drew these while holding the booklet in one hand instead of sitting down properly at a desk or drawing table). 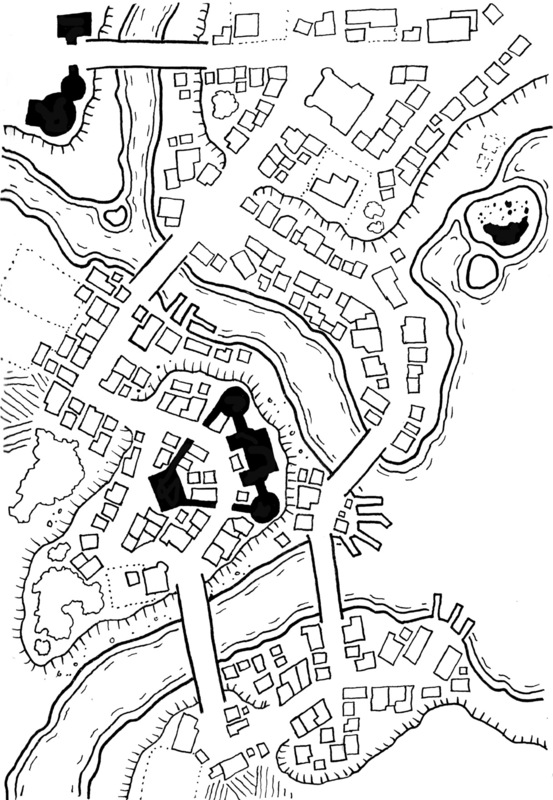 Nonetheless, I really like how this town map turned out with the multiple levels and bridges and decentralized layout. Don’t worry about the uneven lines, etc… I understand that you strive for precision, but if you get too precise, it will look like it was done in a CAD package. I prefer the look and feel of “hand drawn” that your work has. Thanks man. I often overanalyze my work as I put it up. Uneven? That’s not uneven! Goodness, I wouldn’t want to imagine the squiggly mess I’d come up with in such a small notebook.